Are we locked into a global ‘race to the bottom’ on tax? And what does this mean for inclusive growth? Concerns are growing that corporate tax cuts in the developed world are triggering a race to the bottom on corporation tax cuts in the developing world – and the issue is quickly rising up the political agenda. On Tuesday 14 March SPERI will discuss these issues in Parliament at a joint event with the All-Party Parliamentary Group on Inclusive Growth and Oxfam. 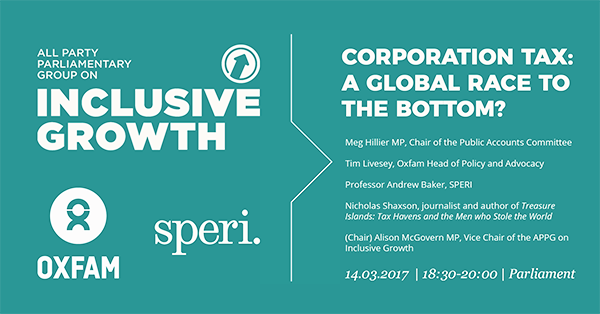 The event is the latest to be organised as part of SPERI’s new partnership with the APPG on Inclusive Growth. A new research paper on ‘tax spillover’ by Professor Andrew Baker, who leads SPERI’s Financial, Monetary and Tax Futures research theme, and Professor Richard Murphy (City University) will be presented at the event by Andrew. The research paper will be published in advance. The event will take place between 18.30-20.00pm on Tuesday 14 March in the Wilson Room in Portcullis House, Parliament. Places are free to book and you can register here. Please aim to arrive 15 minutes before the start of the event to allow time to pass through security at Portcullis House.